Lahaina is a town on the western end of the island of Maui, Hawaii that abounds with restaurants, night clubs, and souvenir shops. Because the western end of Maui is a popular vacation destination, tourism is important to Lahaina. Most tourists, however, eschew Lahaina during the day, choosing instead the beaches of Kaanapali; but life in Lahaina after sunset is quite active. Most visitors arrive on Maui by plane via Kahului airport (OGG). The vast majority rents a car there and drives to various Maui destinations, including Lahaina. The Honoapiilani Highway (route 30) is a very picturesque drive along the shore which gets you directly to Lahaina. The drive from the airport is about 40 minutes, though the road may get congested sometimes. Some people fly to West Maui airport, which is closer to Lahaina (about 15-20 minutes drive). Cruise ships sometimes anchor near Lahaina and passengers get tendered to shore. Lahaina is very compact, and easily explored on foot. If driving, it is advisable to park one's car and walk. There are a couple of free parking locations, but most charge a nominal fee. In some places, stores can validate your parking ticket. Front Street is the main thoroughfare of Lahaina, where most popular places are located. Maui Car Rental 866-344-7612 Maui Car Rental Car rentals on Maui. Locations at Kahului Airport OGG, Kapalua Airport JHM and Kihei/Wailea. Take a stroll down the Front Street, along the shore. Watch people, enjoy the weather, simply relax. Halloween in Lahaina . Lahaina is home to one of the wildest Halloween parties on the islands. 25-35,000 costumed participants fill the streets each year to enjoy the jovial festivities. Some of the more elaborate costumes have taken over a year to make, which adds to the complexity of the colorful scene. Lahaina is a tourist town so you will find many stores selling souvenirs, cruises, activities, art, Hawaiian trinkets, etc. ABC Stores . They are all over Hawaii, and you will find a couple of them in Lahaina. 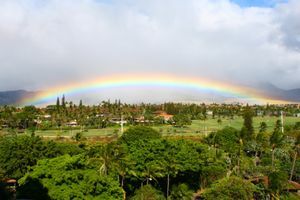 If you're staying for a while, there is a supermarket in Lahaina, and Costco, Wal-Mart and other big stores in Kahului. There is no shortage of places to eat, despite the small size of the city. There are several restaurants that feature fish along front street that are also oceanside. Most of the aforementioned reastaurants have great bars. Places like Moose McGillycuddy's and Cheeseburger in Paradise become night clubs after hours. Hard Rock Cafe is on Front Street. Those are just a few choices. As beaches in Lahaina are not that great, most people prefer to stay in other places on Maui, such as Kaanapali which is only 10-15 minutes away. This page was last edited on 28 October 2018, at 09:17.